1980s SUVs: The Missing Link. It’s incredible that the post war popularity of agricultural Jeep-like vehicles led to the rise of the luxo SUV status symbol. These days, major manufacturers sell a variety of SUVs, most of which will never navigate anything more treacherous than an icy driveway. This trend really took off in the late nineties, when the Germans finally brought out the ML and X5. Forty years later, the market segment pioneered by the Land Rover Series (I,II, III) and the Japanese “response” to the LR: the Land Cruiser, had given birth to luxury limousines on stilts. The concepts vehicles like this introduced consumers to in the fifties and sixties now appealed to a wide variety of people. The benefits of combining 4 wheel drive with pickup truck levels of storage space and a real back seat were appreciated by a remarkably large audience. The driver’s seat of an SUV used to be the domain of farmers, outdoorsmen, and snowbelt residents. But by the late nineties, it was inhabited by the world’s businessmen, teachers, and teenagers. It’s a case of glorious plastic wood and flashy oxblood vinyl vs. a space that was undeniably inspired by the back of a troop carrier. That’s why the Range Rover Classic was such a big deal. It was one of the first, if not the first luxury SUV. Yes, it was released in 1970. But there was no 4 door until 1981, and as such, one can argue that it wasn’t really a family daily driver spec SUV until that point, given how awkward access to the rear seats was. Those 2 door Rangies do look great though, and nice ones have become unbelievably pricey. But that’s irrelevant right now. The four door and it’s sumptuous interior are what I’m interested in. After ‘81, your middle management neighbor could happily drive his kids to school in a Land Rover instead of an S class. If he was so inclined, there was even a long wheel base option. The luxury SUV segment had arrived. The Range Rover classic has aged incredibly well. That seems to be a trend with all of those legendary designs that were penned in the seventies and somehow remained in production through the eighties, and sometimes into the nineties. The same can be said for cars like the E24 6 series, Jag XJS, and R107 SL. They retain a classic aesthetic that was never spoiled by the more modern accouterments manufacturers added later on in their production cycles. Except for post facelift XJS taillights. Those are heinous. Anyway, here’s the RR classic’s interior. Thirty years later, and it still looks like an appealing space to spend a few hours in. You can’t say that about a contemporary Series III. Or most eighties cars for that matter. Buttons, buttons, and more buttons! The only way to do luxury in the eighties, when electric motors were everywhere but there was no way to control all of them via a screen. The biggest display you got was the LCD on your radio. The Japanese competition had adopted a similar ethos. The rugged simplicity of FJ40 and FJ55 interiors was done away with, and replaced with a more passenger car like space in the FJ 60/62. Stylish brown on tan striped cloth seats replaced black vinyl benches. The door cards have the same tasteful pattern on them. The dash was made of deliberately designed molded plastic, not just a slab of metal with some holes in it for gauges and chunky switches. Once again, this is such an inviting place to be for an eighties car, especially if you compare it to the couches on wheels offered by Cadillac and Lincoln at the time. Overall, I think Toyota nailed the styling. The FJ60/62 is my favorite Land Cruiser. It retains that old school greenhouse look that began to disappear in the nineties. So good! And especially nice in white. A lot of the examples I find on craigslist are tan or brown, which these FJs also wear well. They go with the vintage thin pillar look. This is a good example of a questionable shade of brown that somehow works. What a unique build - I bet he’s never come across another mint condition, fully built trooper on the trail. In the US, these are exceedingly rare. Sure, back in the day, they were a poor man’s Range Rover. Now though, they have just as much character as any SUV from this era. And once again, the interior really isn’t so bad. It’s more spartan than my previous examples but nevertheless very much a passenger car interior, not a rugged truck cab. We’re looking at woven cloth door cards, nice seats, and an angular, multicolor, eighties-style molded plastic dash. 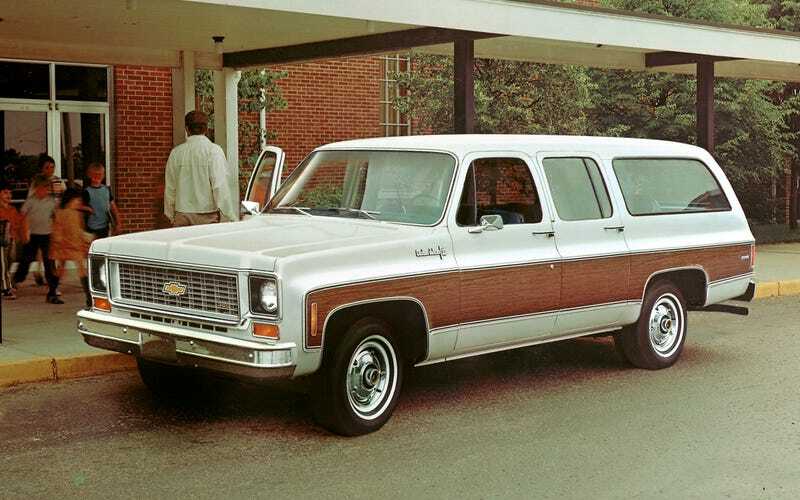 Finally, there’s the Chevy Suburban. I’ve been in love with these since I was a kid. There was a light blue one rotting away in a neighbor’s yard that I used to walk by every day, on my way home from the bus stop. I didn’t know much about cars back then, but it made an impression on me. These come in a variety of fantastically vintage two tone color schemes. A 454 model with 4 wheel drive, a 4 speed, and the barn doors would be how I’d have mine. The barn doors are especially important. These interiors are similar to the Wagooner cabin - lots of colorful vinyl and in some cases, plastic wood. Not here though - there’s a small metal plate surrounding the gauges, and more metal trim, like a concession to the ancient gods of agricultural SUV interiors. Nevertheless, the big comfy seats with separate armrests are a departure from the simple bench seat you’d find in a Chevy truck from the previous decade. So, what’s the point of delving into all of this? Realistically there isn’t one. But we all know eighties SUVs are cool, and I think this is why. They’re a unique mix of old school and new school interpretations of the segment. The powerplants are still archaic - inefficient carbureted I6s and V8s mated to 4 speed transmissions - but they’re comfortable, spacious, and stylish in a way that their military vehicle predecessors were not. Yet still just as capable and rugged as those ancestors, unlike many of the luxury oriented SUVs on sale today. Buy up all your favorites while you can - these are already getting expensive, and for good reason. Eighties SUVs are the missing link.